Gov't & creditors close terms For 3rd Memorandum - Will SYRIZA pass it through Parliament? After a marathon meeting that lasted more than 18 hours the Greek government and the European Commission, European Central Bank, European Stability Mechanism and the International Monetary Fund finally locked an agreement. There is no doubt that the agreement will be painful but with the economy in the state that it is, it is obvious that any other choice would have been absolutely catastrophic. All sides reportedly agreed on the primary deficit of 2015 and surpluses of 2016 and 2017. According to reports the introduction of any new measures in relation to achieving fiscal targets for 2015-2016 were ruled out. The announcement was made on SKAI tv early in the morning and was confirmed by Minister of Finance Euclid Tsakalotos and Minister of Economy Giorgos Stathakis as they were exiting the Athens Hilton where the talks were held and on their way to Maximos Mansion to brief Prime Minister Alexis Tsipras on all the developments. On Monday evening the PM apparently had held phone calls with German Chancellor Angela Merkel, French President Francois Hollande and European Commission president Jean Claude Juncker as well as with European Parliament president Martin Schulz with aim the speeding up of the negotiations in order an agreement to be reached until today (Tuesday). During his contacts, Tsipras underlined the need for the completion of the negotiations according to the EU Summit's decisions, noting that the Greek government is already moving on this direction. Government sources estimate that Tsipras' intervention was decisive and the developments confirmed all sides' volition for an agreement. The reports on Tuesday morning about the agreement claim that mutual compromises were made on issues that had remained unresolved. Such issues include a new privatization fund, energy deregulation and non-performing loans. The government apparently agreed to a primary deficit of 0.25% GDP in 2015 and primary surpluses of 0.5% GDP for 2016, 1.75% GDP for 2017 and 3.5% for 2018, the same reports added. Greece's lenders appear to have backed down on the issue of red-loans (regarding the legal protection against foreclosure), but the government apparently accepted a cap on the value of protection, which will likely be 300,000 euros. The four institutions apparently want a provision so that such problematic loans can be sold to special funds. On its part the government voiced its objection, and presented a counter-proposal for the settlement (or haircut) of such loans by a special management body. Concerning the new fund for the privatization of public assets, Greece's lenders are in favor of upgrading and further improving the existing privatization fund TAIPED, so that outstanding state sell-offs can be completed as soon as possible. The government wants to set up an entirely new body though, which all have a ‘loose’ timetable that will allow it to put out these assets at the best time (or take advantage of the market). The government was negative against a deregulation of the natural gas market and a separation of networks from energy providers, but it does not look like they are going to get their way. Another thing that was discussed was the issue of collective bargaining, collective dismissals and union legislation. Greece's lenders insist that the terms of collective labor agreements only roll over for three months during negotiations, rather than six. A few other issues that were also covered include the abolition of early retirements, with the Greek government wanting to address the matter in October. Also, a special tax for heating oil for farmers is going to occur in two installments, (one in October 2015 and the next in October 2016). It was also agreed to raise the VAT on private tutoring to 23% in order to offset a reduction of the VAT on beef from 23% to 13%. From what we also learn, the solidarity tax is going to remain unchanged for incomes that reach no more than 30,000 euros but is going to increase for incomes over 500,000 euros (or from, 2.8% to 8%). For incomes up to 50,000 euros it will go from 1.4% to 2%, and for incomes up to 100,000 euros it is going to be raised from 2.1% to 4%. Finally for incomes up to 500,000 it is going to reach 6% from 2.8%. Here is the list of 35 'prior actions' the Greek government must implement as a condition for receiving bailout money according to the Kathimerini newspaper. Keep in mind that these are the first 35 proposals, there are just as many proposals coming in October! Eliminate VAT discounts on islands by end-2016. Adopt OECD proposals on liberalizing trade in goods (non-prescription drugs exempted). Limit levies and fees "in favor of third parties"
Cut red tape and accelerate approval process for low-grade-risk investments. Liberalize natural gas market by 2018; other energy market reforms. Approve the privatizations programme undertaken by the country's privatizations agency, the Asset Development Fund. Set dates for privatization bids for the Piraeus and Thessaloniki ports; privatize state train operator with no change in terms. Go ahead with the sale of regional airports with no change in terms. Draw up a list with pending privatizations. Adopt best EU practices on non-salary benefits (e.g. allowances, bonuses) from 1 January 2016. Proposals for expediting court cases. Gov't to also begin slashing MP salaries! 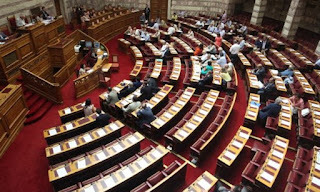 On Monday, Prime Minister Alexis Tsipras held a meeting to discuss a new draft law that aims to introduce a tax on parliamentary allowance, as well as a reduction in the wages of MPs, public utility chairmen and the presidents of independent administrative authorities. Reports said that the new law will tax the monthly allowance given to MPs, including the bonuses for participating in committees. At present only 75% of the parliamentary allowance is taxed, with the pay from committee participation being tax free. The new bill aims to reduce the monthly pay of Ministers, Alternate Ministers, Deputy Ministers, general and special secretaries by 15% and limits are to be introduced on the payment of presidents, managers and board members of public utilities and enterprises. SYRIZA in a mess over new Memorandum! Speaking on Mega Channel on Tuesday morning, SYRIZA MP Kostas Lapavitsas said that the new memorandum should not be referred to as an "agreement” because it is a “bad word”. He said that “we had an agreement on July 21st, now we have a memorandum” and noted that the negotiation procedures were “incredible”, adding that he cannot even describe them. When asked about how intends to vote in Parliament, the MP (who has never hidden his passion for the drachma) stressed that he will first carefully read what will be publicized and evaluate it, underlining that he will not vote for something that he has not read. Obviously distraught, he said that his party was elected based on its anti-bailout rhetoric and program and the new austerity measures and bailout agreement follow the same measures that were adopted by all the governments before SYRIZA. On his part, Vice President of European Parliament and SYRIZA MEP Dimitris Papadimoulis posted on Twitter that “the great majority of members, MPs and the especially the people of SYRIZA support the leadership and policy of Tsipras. This will soon become clear”. However, SYRIZA MP and Left Platform member Stathis Leoutsakos urged the government carry on with SYRIZA's campaign pledges. Speaking on MEGA channel on Monday morning he revealed that SYRIZA's Left Platform is making preparations so that the third bailout is not voted in Parliament. According to him, “SYRIZA and the bailout are incompatible concepts”. When asked whether MPs in the the Left Platform will resign or run independently in future elections, he said that these were “preposterous scenarios” and underlined that it is important to "restore" SYRIZA and the government. The uncertainty and destablization that Greece has experienced over the last seven months must finally come to an end. The few issues that remain to be ironed out can be tackled with mutual compromises, if the political will exits. Let us not forget that a few days after SYRIZA was elected into government, the Greek economy began experiencing a liquidity problem and the country began to live in a state of restricted funding sources. As Tsipras' government played a delay game with the institutions, the European Central Bank began tightening the grip on liquidity. So the stories you hear Frappers about this happening around the time that the referendum was held are all a lie. If you go through the news day by day you will also discover that around the start of Spring (and with an impending impasse looming), plans were already in force for a parallel currency by Yianis with one n Varoufakis and a return to the drachma by the Left Platform. At the end of June the government systematically played this dangerous delay game (with the parallel currency in mind), leaving the economy fully exposed (or to completely crumble), while constantly losing power and options. It came as no surprise thereafter that the doomsday scenarios prevailed. We suddenly saw the outflow of deposits and when talks broke off and the referendum was announced everything spiraled totally out of control. So if it quacks like a duck, and walks like a duck, was it Frappers? Is it a tweetie bird or is it a duck? It is a damn duck! So who is responsible for the mess we are experiencing? It doesn't take a genius to figure out that by removing the protection provided by our participation in the European program, the possibility of a disorderly bankruptcy emerged, capital controls were introduced and the possibility of leaving the Eurozone was directly addressed. Thankfully and after realizing what unbearable consequences were looming for Greece with a possible return to the drachma, Tsipras decided to come back to reality and ensure Greece's position in the Eurozone. What needs to be addressed now is how the government will manage the agreement. SYRIZA is a mess! The terms and conditions of the agreement will determine the political developments that will unfold in the next few weeks but what is paramount now is ensuring Greece’s stability and return to normality. Greece and its people cannot endure any further adventures. Yup... no one in their right mind could have imagined such a crazy turn of events and so much flip-flopping in only six months! Fortunately the lies and myths of "money" existing have finally ended, and a rude awakening to reality has finally occurred! There is still a small fraction of society that refuses to be faced with this truth, but thankfully this is just a small portion now and is really not taken very seriously. Sooner or later, this country will head on the road to recovery. The question is: Did we really need to suffer so much to finally reach this point?